NIA-CHARLESTOWN NEVIS (June 20, 2011) — Permanent Secretary in the Ministry responsible for Public Utilities and Renewable Energy in the Nevis Island Administration (NIA) Mr. Ernie Stapleton, described geothermal energy as a resource that stood to revolutionise Nevis. He made the comment at a recent press conference hosted by Minister responsible for Public Utilities and Renewable Energy on Nevis Hon. Carlisle Powell when a public awareness campaign about geothermal and its benefits to the island was launched. “One of the things that people have to understand is that geothermal is a revolutionary resource… We can build an economy using geothermal energy. If you believe that Four Seasons had a positive impact on Nevis, geothermal energy has a much greater impact on the economy of Nevis and people must understand that. “It is a natural resource and it means that we own it so we will get the royalty. Monies will be paid to the government as long as geothermal power is being produced on Nevis. It is our resource and the royalty is being paid because it is the resource of the people of Nevis,” he said while noting that his statement was based on his own knowledge from reading and from what he had seen the resource do in other countries. Mr. Stapleton, who also has a background in Finance, likened the geothermal resource on Nevis to the oil found in Trinidad and pointed to the fact that that island had built its economy on that natural resource which was also extracted from the ground. However, he also pointed out while oil and geothermal were both natural resources, geothermal was there forever because of volcanic generated heat unlike oil deposits which would eventually be depleted. 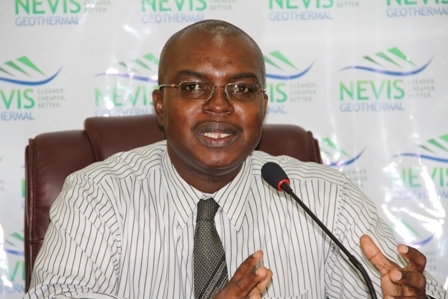 The Permanent Secretary reiterated that the opportunity existed for Nevis to benefit financially from geothermal development, in particular when one considered the export component of the Nevis Geothermal Project. “We have not approached the US Government, we have not approached Puerto Rico in terms of this export, they have approached us and they are saying that they have an interest in what is happening on Nevis. “The potential is there for Nevis to make money because when we export the energy royalties will be paid to Nevis because the energy is being exported from Nevis and that again is added income,” he said. Regarding the national debt, Mr. Stapleton said it was possible that it could be serviced with the financial benefits derived from the export of geothermal energy. “We talk about a national debt in the country? The country can serve its national debt, I believe, using the geothermal energy because what we can do is to develop the economy around the energy. Once you are getting your revenue and you manage your revenue and expenditure, you can reduce the national debt of the country,” he explained. Meantime, Mr. Stapleton used the opportunity to tell residents on Nevis that they should not be fearful of geothermal development. He noted that the NIA had scientists and companies who continued to provide advice on the various stages and processes that will be made with regard to the development of energy.